Unfortunately this dress is currently sold out but I will definitely update you if/when it is back in stock. I was wary at first about the high slits and I am still considering getting it stitched a bit to lower the slit but I loved the feel of this dress. It is super comfortable, hence the shirtdress title and midi length which makes this tall girl a happy camper. A shirtdress is very easy to dress both up and down and is a great versatile piece to have in your wardrobe, you can shop more of my favorite shirtdresses below! Stunning look, that olive shirtdress is gorgeous and I love those sandals. 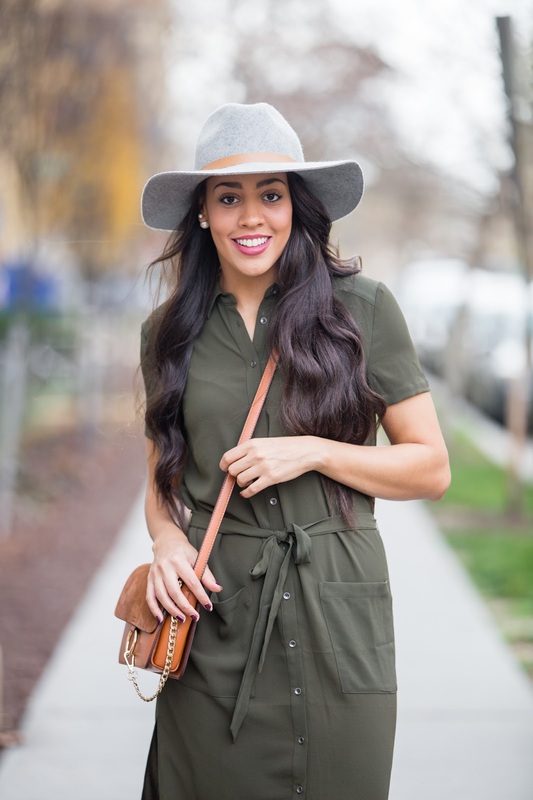 Jasmine, I love this olive shirtdress. And the tan accessories are so on-point esp your gladiator heels! So that's the prettiest shirt dress ever (I might be ever so slightly biased because I adore military green). And the kookiest hat. And you have really cool hair!! !